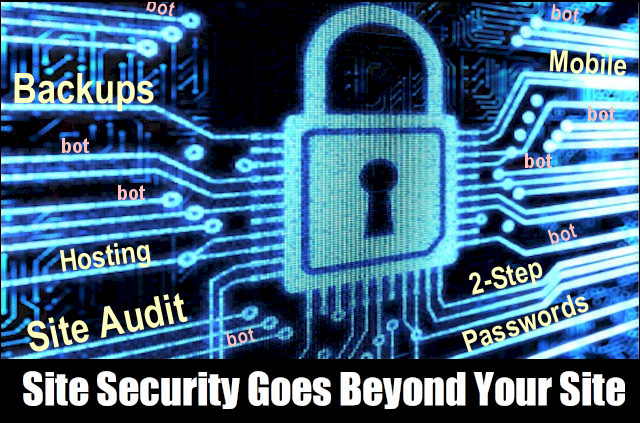 Best site security discussions usually revolve around changes to your login, or adding plugins. But those things alone will not fully protect your site. Much of the low-hanging fruit for hackers actually lies outside your site. Here are easy steps you can take that will make your site, and every other online account you have, more secure. The single best security blanket you can have for your site are several months’ worth of full backup files stored off your site. You don’t know how long your site may have been infected, so having more than a couple of recent backups will help you go further back in time for a good restore point. Yes, you may lose some posts and comments in the restoration. So? That’s nothing compared to losing your whole site. How to Backup Your WordPress Site – get this free report with multiple backup plugins and storage options, all rated, plus tips on setting intervals and other important info to ensure you have an effective backup strategy. Your login password needs to be super strong. But that’s not the only password you need to be concerned with. Here’s the real deal with passwords. Most folks use the same email/password combo for multiple accounts. then all of the other accounts are at risk. Get a cloud password generator/vault – LastPass and RoboForm are good choices. There are others, and many have mobile apps too. More sites and services are offering 2-step authentication now. Use it on all that offer it. Yes, it’s an extra step to log in. So? If you add up all of the that extra time, in a year it still will only be a minute fraction of the time it takes to recover your site or a hacked account. Get your priorities straight on this. Secure your mobile devices. You log in to a lot of apps on it. And you rely on it for the 2-Step Authentication. Ensure that your device log in is secure. Ensure your log in to all apps you use on it are secure. Ensure that you know how to wipe your device, should it ever be lost or stolen. And another thing about mobile. Consider shutting down the ability to post to your site from your device. That keeps a vulnerability vector open. Read more about XML-RPC and shutting it off completely. The best way to prevent a bot attack is to never let them get near your site. Plugins just detect their hits and hopefully reject them. But that eats up precious hosting resources. And attack vectors change all the time, like daily. The best defense against all bot attacks is to keep them from ever reaching your site in the first place. CloudFlare – it’s the only CDN service that also offers some manner of bot protection in the free version. Firewall on your host or other outside service – there are plugins that can do this, but again, the bots have to first hit your site for them to work. Better to have this service a level above, or outside your site. Hackers want access to these devices for 3 reasons. Hangout with me on G+ That’s where I cover news as it breaks and give you links and info for what you need to know and how to protect yourself. Get to know more about different bot attacks, cyber security, and site performance, so you can properly vet the info you read online. Full Site Audits are the only way to get everything checked on your whole hosting account and site. A deep dig through your database, core files, and plugins will make a world of difference to securing your site, and giving you peace of mind.